Here at TNW, we love ourselves some podcasts, whether it’s to relax on a weekend, distract us from the pain of building muscle at the gym, or killing time on a long commute. The world of podcasts has steadily grown over the past few years to accommodate a wide range of interests and niche topics, from politics to police work to poltergeists. And it doesn’t hurt that most of them – even the best ones – are free to stream and download. Each week, we’re rounding up the team’s favorite podcasts for every sort of listener, in the hopes of either turning you onto podcasts in general or helping you find a new show to try. 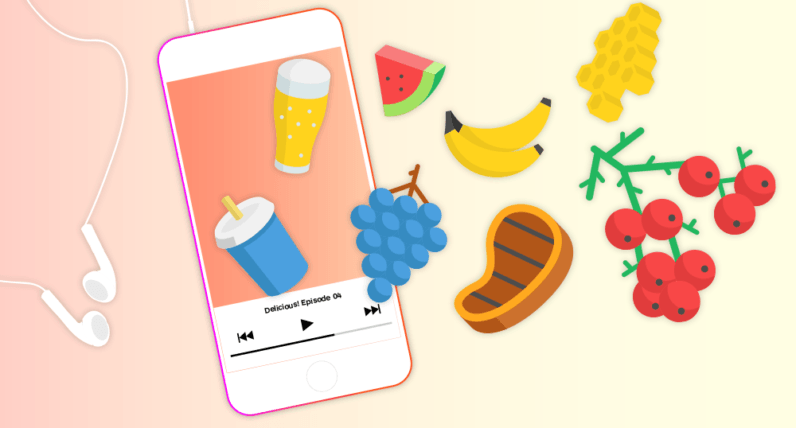 This week, we’re focusing on podcasts for foodies, gourmets, chow hounds or whatever else you food nerds like to call yourselves. If you’re just getting started with podcasts, you’ll want to get an app to browse, download and play them on your phone. Android folks can try Pocket Casts ($4), Acast (free) or Player.fm’s Podcast Player (free). iOS users will find Overcast (free) up to the task. This incredible show about all things food – from the evolution of cuisines, to the origins of ingredients, and practical tips on achieving brilliant results in your home kitchen – has been around for more than 20 years, having started off as a radio program from American Public Media based in St. Paul, Minnesota. For most of that time, it’s been hosted by journalist and author Lynne Rosetto Kasper, who did a fantastic job taking people through the intricacies and idiosyncrasies of food cultures from around the globe as well, and sharing tips on improving your own cooking – all with the help of luminaries from the culinary universe and a voice you could listen to for days on end. Now, award-winning host Francis Lam has taken over the reins, bringing a different vibe to the same recipe that made the original show a treat. The Splendid Table is perfect for people curious about food, whether they’re professional chefs, budding home cooks, or street food aficionados halfway across the planet like me. Episode 591: Cryo-Blanching features J. Kenji Lopez-Alt, the mad scientist of cooking, as he describes his process for improving on classic techniques; there’s also rocker Sammy Hagar talking about his deep, but little-known connection to food. Oh, and it also includes my favorite segment with Roadfood’s Jane and Michael Stern as they share their delicious finds from America’s freeways. Hosts Cynthia Graber and Nicola Twilley put food under the microscope for a closer look at the history and science behind the things we eat. You won’t hear from as many chefs and restaurateurs on Gastropod as you would on other food shows. Instead, the hosts talk to farmers, researchers, and historians to dig up fascinating stories about things like our near-universal love of chocolate, how spices become popular, and the politics of salt. Inventing the Restaurant: From Bone Broth to Michelin is a deep dive into how restaurants came into being, changed the way societies interact with food, and how America fell in love with restaurants. I’ve heard James Beard Award-nominated host Dan Pashman’s voice on a bunch of other podcasts, and his own show isn’t half bad. He’s at once an authority on food culture, and a lovable host who sounds like your drinking buddy at your favorite dive bar. With The Sporkful, Pashman explores stories and ideas that connect food to people in a quest to discover why we eat what we eat and how we eat. If you have food on mind even when you don’t have a plate in front of you, you need to listen to The Sporkful. In Cooking Pad Thai for 20,000 People, Food Network star Jet Tila, who opened the cafe at Google’s HQ, describes his experience growing up in Los Angeles, learning the ropes from his grandmother, protecting his family’s establishment during the 1992 riots as a high school student, and cooking with thousands of pounds of Thai ingredients at a time. Enjoyed our recommendations? Share your own favorites in the comments, and stay tuned for a new bunch of podcasts every week here at TNW. Happy listening!